Fianna Fáil’s Michael McGrath said the Central Bank will be grilled on the tracker mortgage scandal next week. 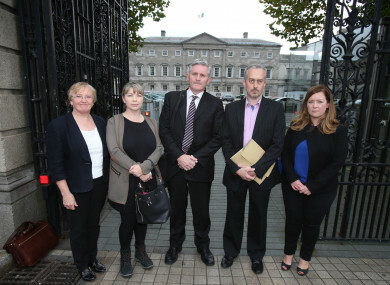 Left-right) Helen Grogan, Hazel Melbourne, Padraig kissane, Thomas Ryan and Niamh Byrne arrive at Leinster House in Dublin, to give evidence during the Oireachtas Finance Committee. THE CENTRAL BANK are to face a grilling over the tracker mortgage scandal when they appear before the Oireachtas Finance Committee next Thursday. Fianna Fáil’s finance spokesperson told party members at the party’s Ard Fheis in the RDS this afternoon that the handling of the tracker mortgage scandal by the banks has “been a disgrace”. The scandal has seen thousands of customers in a number of financial institutions in Ireland charged higher rates of interest than they should have been. Earlier this week, a number of customers impacted by the error spoke before an Oireachtas committee, detailing how some of them have lost their homes, suffered strokes, and had nervous breakdowns due to the stress caused. Financial advisor Padraig Kissane has said some 30,000 customers could be affected. “Customers were overcharged, often by hundreds of euro, every month, yes, every single month, for many years. To put in plain simple language – the banks took their money. “Some customers have lost their home as a result, others have had their lives turned upside down, their dreams shattered,” said McGrath. I am sure many of you are curious, like me, and those at home are, as to how all the main banks happened to make the same mistake. We need answers. The Central Bank will be before Oireachtas Finance Committee next Thursday and they will be rigorously questioned. I am sure you will join with me in sending out a very clear message from the Fianna Fáil party at this Ard Fheis that it is not good enough. Those who have not been repaid need to be repaid now. Customers should be compensated immediately and people have to be held accountable as to how this happened in the first place. The Central Bank is to publish its tracker mortgage examination update on Tuesday. Yesterday, speaking in Cork, the Taoiseach Leo Varadkar said the banks should apologise and pay back the money, plus compensation. He said that as far as he is concerned, the deadline for this was yesterday. Email “'The banks took their money, turned their lives upside down, and shattered their dreams'”. Feedback on “'The banks took their money, turned their lives upside down, and shattered their dreams'”.